Boys and girls, that’s yours truly grinning madly from the cockpit of an Aston Martin DB7 Vantage Volante. Yeah, that’s right: the car James Bond drives. All 12 cylinders of it. And it would be worth every dime—at least to me it would. I’m not a car buff. Last week, a mechanic botched tightening the oil plug on my wife’s car and we lost most of the oil out of the darned thing. I had to call my neighbor over to ask him if he could help. In short, cars are akin to Chinese puzzle boxes to me. I can talk car models…some. I can name all the manufacturers and most of the models, but that’s memory folks, not a love for cars. I hang with other guys and they start talking compression ratios and all that other stuff, and I’m lost. They’ll discuss one trick ride after another, and all I can mumble in response is “I’m crazy about Aston Martins.” Most of the time, the Mustang and Charger folks have no idea what I’m talking about. I think the Astons possess a combination of elegance and raw power that just grabs me. The DB7 is universally considered by auto experts to be one of the most beautiful cars ever built. Pair that with the sensation of riding in a leather-seated cannonball, and perhaps you’ll understand the appeal. Aston Martins are rare in this country. Only 19 states have a dealership. (Ohio’s is in Dublin, headquarters of Wendy’s.) Needless to say, I’ve never seen an Aston in person. I’ve been told that even at international auto shows they keep them behind glass—look but don’t touch. My wife and I have been part of a small group for about six years. That’s where I met Tom. Now Tom’s a British car buff and drives a Lotus himself (and yes, he’s taken me for a spin in it), but I don’t think even he connected with my fascination with Aston Martin. 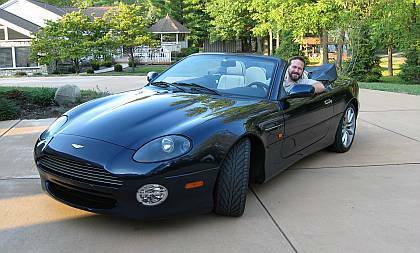 But this last Friday, on a picture perfect day, Tom dropped me a morning e-mail telling me to expect to see a DB7 at small group that evening. I had to read the e-mail about five times. An Aston Martin in our fair city? Never. How would it be possible? I spent all day Friday with goosebumps waiting…waiting. When we pulled in that evening, there it sat, smiling at me with that gorgeous Aston grin. Solid. Confident. Refined. Flawless. Gleaming. And a Volante (convertible) to boot! Words can’t describe how amazing this car is. It’s one of the few things I’ve ever experienced that lived up to the hype. Tom and I talked (and used a normal speaking voice, even in a convertible—amazing) and he told me he’d borrowed the car from a former law partner. Ralph had only received the car a few weeks before. Now the part about this that tore me up came when I asked Tom, “Did you do all this just for me?” He looked me in the eye, and with a big grin on his face, simply said, “Yes.” I had to glance away to the setting sun so he wouldn’t catch my eyes welling with tears. Of course, most of the folks at the small group wanted a ride, including my wife. With a gleaming smile, she said she needed to understand me just a little bit more, and what better way than to ride in one of those “Aston Martin cars you always talk about.” She jumped in the passenger seat and Tom came round to drive. I said to them both, “Now I’m doubly jealous.” At this Tom sauntered over to me and dangled the key. “Drive,” he said. Now there’s something about me you all need to know. I do an excellent job of seeing all the things that could possibly go right and wrong in life. Sadly, I do a better job envisioning the wrong portion of that equation. In that second, my heart just about stopped when I pondered the possibilities: a rock tossed up by a truck cracks the windshield, my foot jams between the brake and the accelerator and it’s Audi 5000 time, or a car of joyriding teens making their way to the high school nearby gets caught up in the joyriding and misses a stop sign, WHAM, right into a British supercar that costs as much as a house. All those scenarios crashed in my brain. It’s not my car. It’s not even Tom’s car. Our friendship would never be the same if anything happened to the DB7. I’d never live it down if something happened. With my adrenal glands pumping out enough juice to wire an elephant, I waved him off and watched him drive away with my wife. On walking back to the house, my heart still fluttering, I was greeted by the rest of the small group. “Tom offered to let me drive,” I said, “but I just couldn’t.” A cadre of incredulous faces greeted me. I asked, “I’m a moron, aren’t I?” “Yes” was the group consensus. But it wasn’t right. It was too much responsibility! I have enough of a dilemma driving a friend’s car, but a friend of a friend’s? A plethora of gruesome possibilities for error and damage rose up again. Bankruptcy! Debtors’ prison! The worst possible outcome of a Dickens novel! Little Nell! Oh no, Little Nell! How could I possibly handle it? Did I mention this car costs as much as a nice house? Yet I walked down to the curb and stood there, sweating. A few minutes later, they returned, and I nervously waved Tom out of the driver’s seat and hopped in. Carefully, I took my dream car, my gorgeous wife at my side, for a very short spin within the subdivision. All told, I think we drove less than a mile. But that was enough for lesson number two. Now what does it all mean? Who here isn’t crying with joy? Do we know how much we are loved? The cattle on a thousand hills! The empowering of the Holy Spirit! Eternal life purchased by the blood of the One who loves us more than anything! But some of us get handed the keys of that Kingdom and we back off. It’s too much. Too many things might go wrong! How can we handle the responsibility? So we shrink away and miss grabbing onto that Kingdom of unrelenting joy and going to the unimaginable places the King intended us to go. Something about me grew last Friday. Because of an amazing car. Because that car stood proxy for something priceless. More than anything, it stood for someone who loved me enough to go to extraordinary lengths to fill my life with joy. More than anything, it stood for the willingness of that someone to trust me to drive what he’d labored to secure for me. Now take the keys and drive. Gee Dan, I’m a redneck NASCAR fan and wonder why you didn’t powerbrake it and smoke the tires! I think we all could use a friend like Tom, do you think I could borrow him for a while? As fantabulous as that car is, the application means even more to me. The change in the banner is AWESOME!!!!!! A surprise is nice as long as it’s not one that stops your heart! Just for fun, here is my dream car. Like honey from the comb, Don. Thanks, Dan! You really put a smile on my face. Thanks for asking, but I’m a hopeless dweeb when it comes to cars. They frustrate me greatly, and I long for the kind of public transportation I used when visiting my grandparents in Germany. I can’t even understand them enough to even have a dream car. My dream would be to make my wife happy and buy a family vehicle manufactured this decade. Or to afford a minivan, particularly one with fewer than 150,000 miles on it. I don’t mean to be a wet blanket. I have no problem with people having a dream car. Still, how I feel when people start talking about cars is probably similar to how you feel when the topic is college or professional sports (see Brant’s latest blog posting for great satire on that ). Thanks Dan, for blessing us because you were blessed! Great, GREAT application. Thanks for sticking all the way through that long post to even GET to the application! A few months ago I had been suffering with a bout of depression that kept me in bed for a couple of days. My husband, once he realized what was happening told me to get dressed because we were going out. We drove past car dealerships until he found one that had a little Mini Cooper out front (there is no authorized dealer in town). We went in and I took it for a test drive. Blues banished! In my minivan, we don’t count VWs. We shout “Mini Cooper!” whenever we spot one. And my eight year old son insists he will buy me one some day. My dream car isn’t as fancy (or costly) as yours, Dan, but I sure understand the excitement! Dan, you ARE going to have that photo blown up to poster size, framed, and mounted on your office wall, right? Dan, this was priceless. My daughter and I experienced something that was also huge and afterwards we discussed that as huge as the experience was, it was seeing God’s hand and hearing His voice in the experience (almost instantaneously) that meant more than the experience itself. I LOVED the application. You are an excellent story teller, Dan. Thanks for blessing us all with your gift. Thanks, Patricia, for those kind words. I’m spending today trying to sell a few of my short stories to publications, so your comment was an encouragement. Glad that you got to drive your dream car!!!! CONGRATULATIONS GO OUT TO YOU!!!! Something about the typical American man or teenager when it comes to the fascination of an automobile. I got to where I love reading car blogs now to find out about Corvette’s new Blue Demon or the latest from the BMW camp. Couple things came to mind as I read this post. Number one, how refreshing it was to read. Number two, the powerful analogy. and does it, WITHOUT THINKING! Then- he becomes self aware- I CAN’T DO THIS! The waves! The Water! I’M NOT SUPPOSED TO BE OUT HERE!!!! YIKES! a drive in an Aston Martin! I can so relate to how you felt about driving that car-what if this, what if that….can’t you just hear the Lord saying….fuhgetaboutit! DRIVE! Notice how we’re so comfortable admiring a car like that-appreciating it, describing how great it was just to see it up close- but driving it is a whole other matter. Your story reminded me of a quote I read recently- I found myself to be much more of an admirer of Christ than a follower of him. or- to put it another way…. Aston Martin has a good design taste :), just i dont like too much the cabrio versions. Excellent post, Dan. Thanks for sharing the moment…. Great article. Thanks for reposting it. Tom is a good fellow.